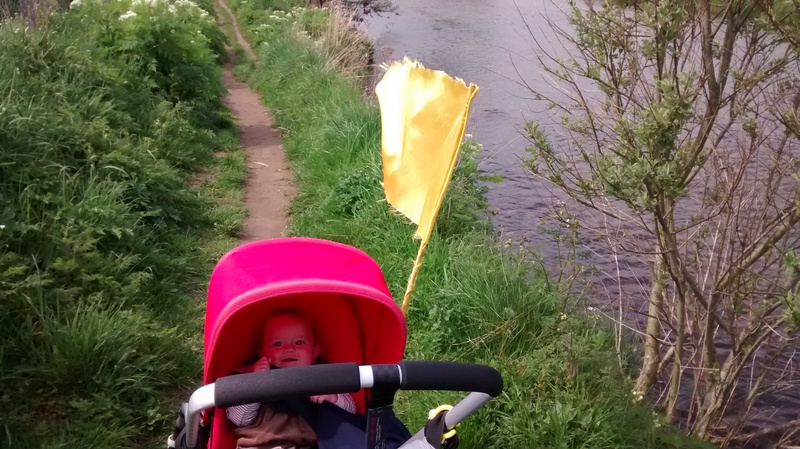 I set out to test the passability of the path alongside the Deveron. I try a different route to get there, though a little bit of Huntly that I’ve not had reason to walk through yet. 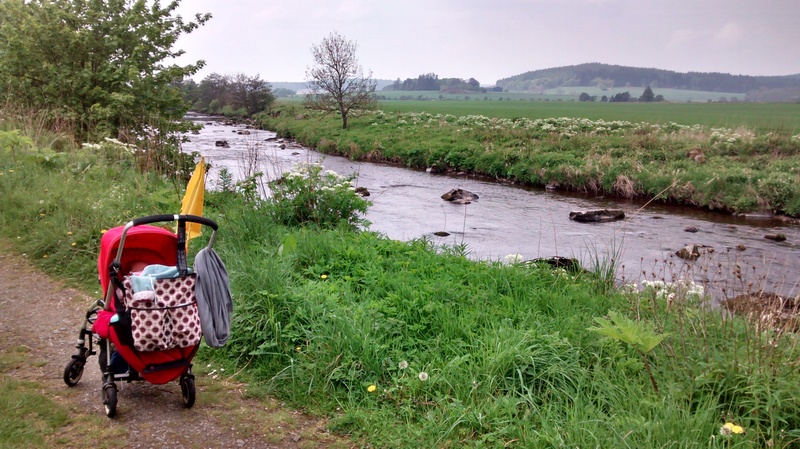 We find our way through the houses, after one wrong turn into a cul-de-sac, and down past the playing fields to the riverbank near the castle. By the Nordic centre we try the small path that runs directly along the riverbank. Surprisingly it is quite ok to push along. It’s narrow, and one set of wheels are up on the grassy edge, but as it’s reasonably dry it’s not too much hard work. 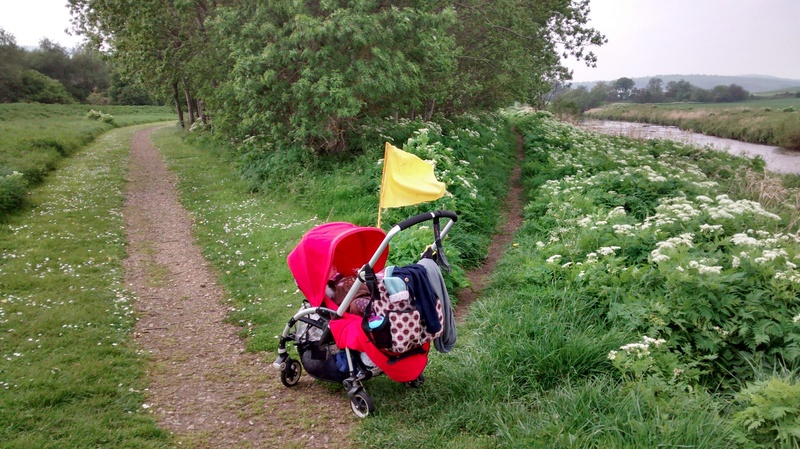 There are a couple of points where I lift the pram over a rock or and very rough bit. 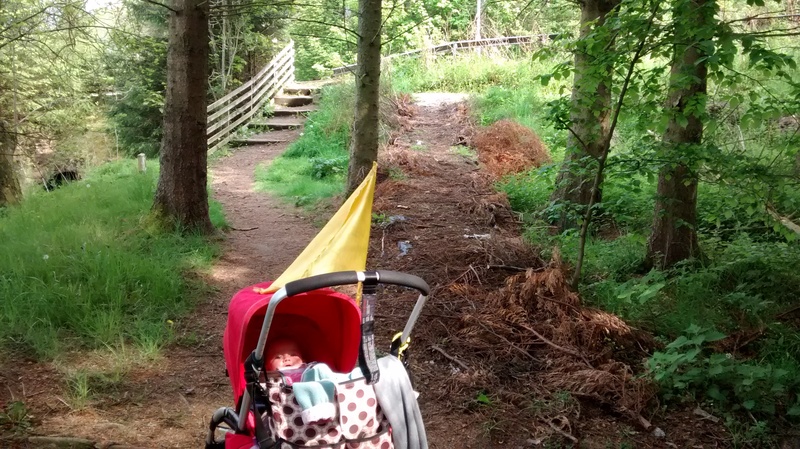 It’s fine with Ruby in the pram, but I’d have turned back already if I had had Ernest in there. It’s a beautiful day, and I want to keep going. The path gets harder, but I go ahead a little to see if it gets better or worse, I don’t want to turn back. After the Nordic centre the path splits – the narrow riverbank one, and a higher, wider, firmer one. I take the easier option and walk along the raised path. I’m tempted down again by a third option, a lower path that runs nearer to the river, if not right beside it. I can see the road ahead and the steps up to at the bridge, but I can’t get that far. I stop before I have to, the path is very close to the water now and I’m nervous that I could slip and both of us would end up in the water. So we turn back, and follow a well made path across the meadow towards a housing estate. We are tempted into the woods by a sign for the Meadows Planting walk, and follow the path alongside a stream. 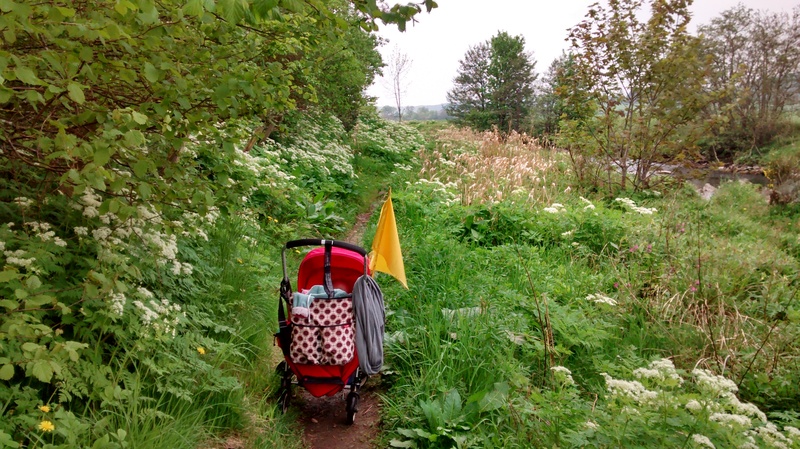 Again it’s beautiful, and feels extraordinary that I can get my little city pram along the path (which I can quite easily). 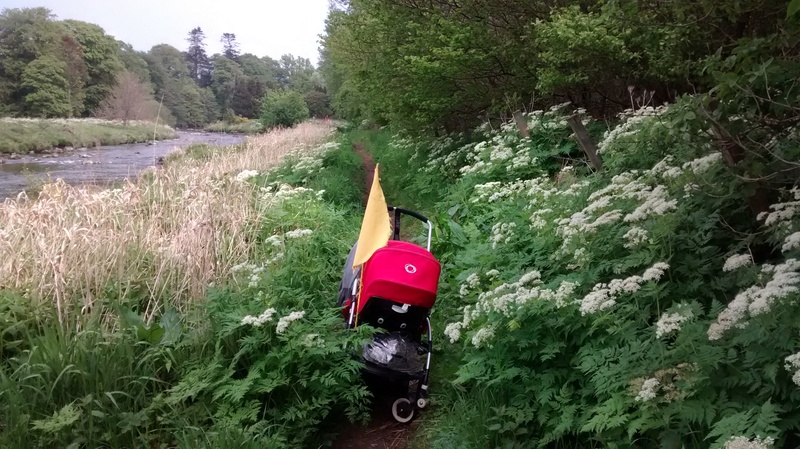 But then it goes back up to the road via steps – I’m about to carry the pram up when I notice a partly made ramp to the side of it. I balance my phone in a pile of sticks to record the push up (I can see it’s going to be a bumpy one). Might even have been easier just to lug up the steps. On the other side there are steps back down to the lovely path, and a ramp – but it’s very steep and doesn’t look as wide/intentionally made as this one, so I carry on on the road and loop back around and up towards the Square.